Our experts hand-picked this Southern Caribbean island-hopping cruise on the completely transformed Celebrity Summit! The Summit just unveiled its revolutionary enhancements, making it more like the new Celebrity Edge. Receive Great Pricing + Exclusive $75 Onboard Credit per stateroom! Puerto Rico is one of the largest islands in the Eastern Caribbean. Discover the classic signs of a vacationer’s paradise on one of our many cruises to Puerto Rico: gorgeous landscape with lush green mountains, underground caves, balmy waters, white-sandy beaches, delicious rum drinks and so much more. Spend an afternoon snorkeling during your cruise to Puerto Rico and discover the beautiful marine life of the Caribbean Sea while swimming among the fish, coral communities, mangrove forests, and seagrass beds. Besides being one of the most scenic islands in the Caribbean, Tortola also has a fascinating cultural and historical side. Hike along the seven available walking trails in Sage Mountain National Park for stunning panoramic views of the island and the surrounding natural habitat. Snorkeling in the crystal-clear Caribbean Sea and a rum tasting at Callwood Rum Distillery are essential on a cruise to Tortola. Cruise to St. Maarten and explore the dozens of alluring beaches that ring the island. At Orient Beach, sunbathers bask and beachcombers stroll on the white sands, while divers and snorkelers explore the sunken shipwrecks and marine life just offshore. Embrace all the beauty of the island on a tour to the French capital, Marigot, where you can explore the quaint streets and cafés, open-air market, and 18th-century Fort Louis. On this tiny island of Roseau, Dominica, with its high mountains and unusual beaches, you can explore volcanoes, rainforests, and a reef that bubbles. In the capital, Roseau, you’ll sway to the infectious rhythm of reggae and behold the historic architecture of the French Quarter. Discover the black sand beaches, eerie shipwrecks, and teeming Caribbean reefs. When Bajans say, “Life’s a beach,” they mean 80 pristine beaches, some long and straight, some hidden among cliffs, many among the world’s most beautiful. Cruise to Barbados for water sports include jet skiing at lively Mullins Beach, paddle boarding at Pebbles Beach, and surfing at Atlantic Shores. Small boats will take you swimming with the turtles, or you can skipper your own Hobie Cat, try spearfishing, or lounge aboard a luxurious catamaran with drinks. *Price is per person based on double occupancy, availability and subject to change without notice. Price was as of 3/22/19. 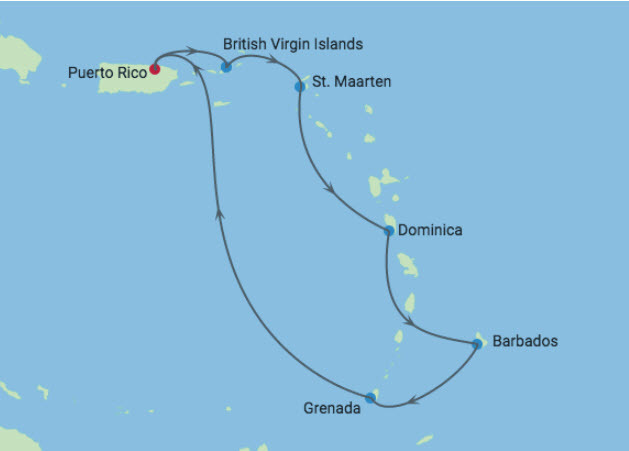 Taxes, fees and port expenses are additional at approximately $83.30 per person. Other restrictions may apply.